I have no clue why I waited so long to read this book, I’m kicking myself for it now. I’ve known about it for so long I just never read it. In Unremembered we follow this girl who wakes up in the wreckage of a plane crash where she is the only survivor. She has no memory of who she is or what happened, she is a blank slate. To top it off no one can find anything about her, it’s as if she never existed. Every clue she finds as to who she is just leads to more questions. Her only hope is a boy who claims to have known her, he tells her that there are people after her and that they need to run. Can she trust him? Will they make it to safety? I’m terrible at summaries, I apologize. Clues. Through out the most of the book we are given clues to as what has happened to Sera. She finds things and gains information and honestly I wasn’t sure how it was all going to fit together, but it did and it was amazing. Science. I love the whole mad scientist thing, when greed and power overcome the desire to help. I just liked the general science feel to it, and the psychologist part of me was fascinated with the memory aspect of it. I won’t go into more detail than that because of spoilers. Experiences. Since Sera is now a blank slate we get to follow her as she learns about and experience things for the first time. Like when she has grilled cheese for the first time or learns about the internet. Cody. He had this great kind of dry sarcastic humor and he was the perfect form of comic relief. The romance. I went into this book with no expectation of romance, I had no clue it would play as big of a role as it did. It was important in the book, yet it was so… soft. Maybe quite would be a better word. It was always there driving the plot along, but it wasn’t in your face screaming at you, which I liked. It didn’t over power everything else like romance tends to do sometimes. This book was kind of hard for me to find actual quotes for because 1. I’m still getting good at the finding quotes thing, and 2. I found with this book that instead of finding a sentence or two that I liked, I found whole paragraphs or scenes. There is a little but nothing too bad, I’d say PG-13. I was impressed by this and appreciated it, it was refreshing. Why do all Ya books think they have to have tons of cursing in them? This book is great and now I’m going to read the other two in the series before the North Texas Teen Book Festival. Jessica Brody is amazing. I’ve met her several times. Her website is full of advice for writers and she even has a controversial post about her thoughts on writers block, you can read that here. Click the links below to her media sites. 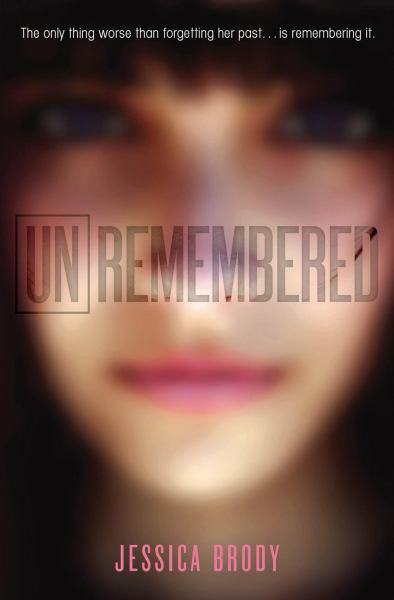 Unremembered has a pretty good book trailer that you can watch here. After that spend tons of time on Jessica Brody’s YouTube channel, she has tons of great videos, and it would take forever to link them all. Diotech has it’s own Facebook page. I love it when they make companies in books seems so real. There is talk of a movie, but as far as I can tell there hasn’t been much progress, you can follow it on the movie Facebook page and if progress is made you will know about it. Lastly, this is the book’s Facebook page. Have you read Unremembered? Were you as swept off your feet as I was? Also, I really appreciate the “quills” of your reviews. I’m not fond of cursing or too much sexual content either.